In a significant diplomatic win for Israel, US Senator Lindsay Graham—a former candidate for president and a key member of US President Donald Trump’s Republican political party—on Monday openly endorsed Israeli sovereignty over the strategic Golan Heights that border Syria. “I’ve got a simple message. I will go back to the United States Senate. 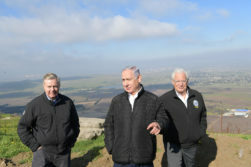 Working with Senator [Ted] Cruz, I will start an effort to recognize the Golan as part of the State of Israel now and forever,” said Graham during a visit to the Golan with Israeli Prime Minister Benjamin Netanyahu in comments published by Netanyahu’s office. Graham didn’t stop there, continuing by highlighting that the history behind the territory Israel captured from Syria during the 1967 war is further evidence that Israel should keep it. “Israel occupied this territory by fighting for its survival. This territory was taken by military force because it was used as a launching point to attack the State of Israel. 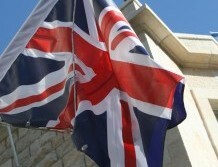 This territory has a rich Jewish history,” said Graham. 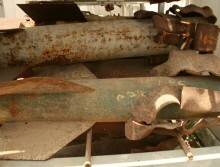 More rockets were fired from Gaza at Israel over the weekend, and Israel responded with air strikes on terror targets. As the tensions between Israel and terrorists in the Gaza Strip brew, Israeli Prime Minister Benjamin Netanyahu had a warning to those who think that next month’s election in Israel will prevent Israel from engaging in another full-scale military operation in Gaza. “I suggest to Hamas—don’t count on it. We will do everything necessary to restore security and quiet to the area adjacent to the Gaza Strip and to the south in general,” said Netanyahu on Sunday in comments released by his office. 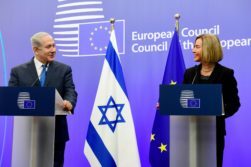 Based on Netanyahu’s comments, which were published by his office, that could mean that Moscow has concurred with Israel that Iranian base-building for a permanent presence in Syria is not acceptable. And Netanyahu and Putin even have a concrete plan for clearing Syria of these foreign forces: “We agreed to establish a joint team to advance this goal, together with other elements.” Russia is a key ally of Iran and may have diplomatic tools for influencing Tehran. As the Israeli and Russian leaders found one commonality after another between their countries in their meeting on Wednesday, it certainly didn’t look like Israel and Russia had tense relations just months ago. 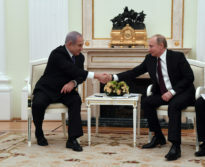 Israeli Prime Minister Benjamin Netanyahu highlighted that he and Russian President Vladimir Putin had met 11 times in the last three-and-a-half-years, even as this was just the second face-to-face meeting—and the first in Moscow—since Russia accused Israel of negligence that led to a Russian plane being shot down last September by Syrian air defenses, according to a report at the time by Sputnik International. While Israel denied the claims, Russia moved forward anyway with arming the Syrians with an advanced air defense system in response to the event, per a twitter post last week from ImageSat International. Yet just five months after the incident, and there was Putin accepting an invitation to visit Israel for the dedication ceremony for a memorial in Jerusalem to those who fell during the siege of Leningrad during World War II.